Go north on Co. Rd. 519 from M-28 in Wakefield for about 15 miles to Porcupine Mountains State Park and continue about 2 miles into the park (or follow South Boundary Road, to its western end in the park to reach 519 and go left on 519 about 1/2 mile south of South Boundary Road.) Park on the side of the road. The falls is through the woods to the east. There is no marked trail to the falls; in fact I could find no trail at all. The Michigan Waterfall book suggests marking a trail to be safe - walk to the river and go upstream or downstream to reach the falls. The falls is described in the Michigan Waterfall book as "created as the Presque isle River slides about six feet over a section of conglomerate rock - is more a large rapids between two smaller rapids than a falls." I visited this fall in the summer of 1997. I'm not sure whether or not I found the falls. I tried to get clearer directions from the park registration building, but no one there knew how to find the falls. 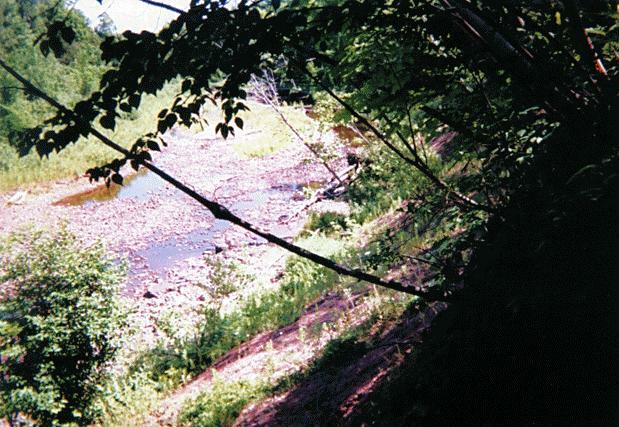 When I walked into the woods from 519 I reached the river bank - it was quite high and very steep, and the river bed was quite dry with just a small amount of water in it. 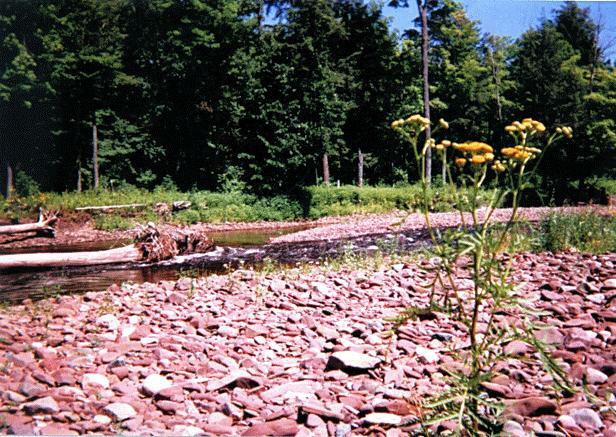 I climbed down the bank and followed the river bed to the right (south and upstream) to where it flowed heavier (to a Y) and found some rapids where the river bent and flowed to the east. I couldn't see anything else either upstream or downstream. If anyone has been to Iagoo Falls and can tell me whether or not I found them I would appreciate hearing from them. If I didn't find them I would love to get better directions and/or a photo of the actual falls. Information sent to me by Dag Grada: Iagoo Falls - It is an interesting coincidence (?) that Iagoo happens to be a trickster character in Ojibway legend. He is also a renowned liar and braggart. There are no waterfalls or significant rapids in this stretch of river. Then again it may be that history has misplaced this falls. Below Lepisto Falls there is another waterfall which kayakers refer to as "Little Lepisto". This may be the missing Iagoo falls. Do a search on the word Iagoo to find the Longfellow verse on this character. Here's a photo looking down at the riverbed from the top of the bluff.